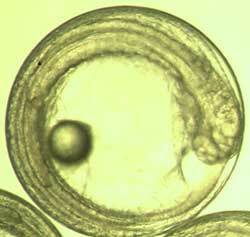 There is more proof that the toxic agents in crude oil are damaging to the development of fish embryos. A study, “Deepwater Horizon Crude Oil Impacts the Developing Hearts of Large Predatory Pelagic Fish,” to be published on March 25, shows that several Gulf of Mexico fish embryos developed serious defects in heart development following exposure to crude oil from the Deepwater Horizon oil spill. This study is the first to analyze the effects of the primary toxic agents released from crude oil on several commercially important pelagic fish species that spawn in the Gulf of Mexico. The study in the March 25 issue in the journal of the Proceedings of the National Academy of Sciences (PNAS), assessed the impacts of polycyclic aromatic hydrocarbons (PAHs), a toxic agent released from crude oil, from Deepwater Horizon oil samples on embryos of bluefin tuna, yellowfin tuna, and amberjack. Embryos were exposed to two different oil samples, one collected from surface skimming operations in the Gulf of Mexico and another from the source pipe attached to the damaged Deepwater Horizon wellhead. A vast number of the water samples collected at the Deepwater Horizon oil spill site had PAH concentrations exceeding the toxicity thresholds observed in the study, therefore researchers demonstrated the potential for losses of pelagic fish larvae during the 2010 Deepwater Horizon disaster. The embryos used in the study were collected from research broodstock located at land-based fish hatcheries in Australia and Panama. Test methods were developed and designed by Dr. Grosell and Dr. Benetti’s team at The UM Rosenstiel School’s experimental hatchery facility. Exposure to each oil type produced virtually identical defects in embryos of all three tested species. For each species, oil exposures caused serious defects in heart development, and abnormalities in cardiac function, indicating crude oil cardiotoxicity. Bluefin tuna showed the highest percentage of larvae with the entire suite of defects, and their populations are currently listed by the IUCN as endangered due to historically low levels. The Deepwater Horizon oil spill in the northern Gulf of Mexico released more than four million barrels of crude oil into the surrounding waters during the seasonal spawning window for bluefin and yellowfin tunas, mahi mahi, king and Spanish mackerels, greater and lesser amberjack, sailfish, blue marlin, and cobia, all commercially and ecologically important open-ocean fish species. “Vulnerability assessments in other ocean habitats, including the Arctic, should focus on the developing heart of resident fish species as an exceptionally sensitive and consistent indicator of crude oil impacts,” said the paper’s authors. Another recent study of the Deepwater Horizon spill found that oil spills can trigger cardiac arrest in fish affected by the spill. A study of an oil spill in San Francisco Bay in 2007 found “unexpected lethal impact on embryonic fish,” according to scientists from the University of California at Davis and the US National Oceanic and Atmospheric Administration who spent two years on follow-up research after the spill. The long term impact of the Exxon Valdez spill on the developing fish embryo is still being hotly debated.